Drawn and Quarterly, 9781770463318, 216pp. Rage. Depression. Divorce. Politics. Love. A visceral story that you can see, taste, and feel. How could this happen? The question of 2016 becomes deeply personal in James Sturm’s riveting graphic novel Off Season, which charts one couple’s divisive separation during Bernie Sanders’s loss to Hillary Clinton, Clinton’s loss to Donald Trump, and the disorienting months that followed. We see a father navigating life as a single parent and coping with the disintegration of a life-defining relationship. Amid the upheaval lie tender moments with his kids—a sleeping child being carried in from the car, Christmas-morning anticipation, a late-night cookie after a temper tantrum—and fallible humans drenched in palpable feelings of grief, rage, loss, and overwhelming love. Using anthropomorphized characters as a tactic for tempering an otherwise emotionally fraught situation, Off Season is unaffected and raw, steeped in the specificity of its time while speaking to a larger cultural moment. A truly human experience, Off Season displays Sturm’s masterful pacing and storytelling combined with conscious and confident growth as the celebrated cartoonist and educator moves away from historical fiction to deliver this long-form narrative set in contemporary times. 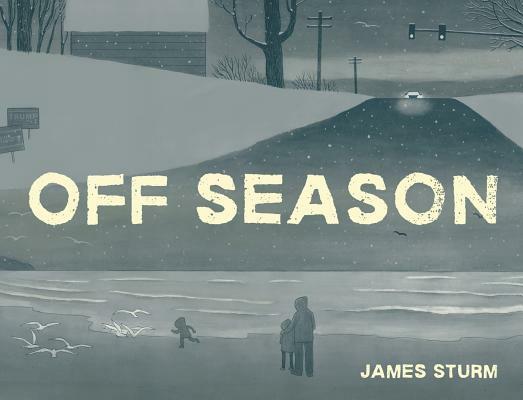 Originally serialized on Slate, this expanded edition turns timely vignettes into a timeless, deeply affecting account of one family and their off season. James Sturm is the author of several award-winning graphic novels for children and adults, including James Sturm’s America, Market Day, The Golem’s Mighty Swing and Satchel Paige: Striking Out Jim Crow. He is also the founder of the Center for Cartoon Studies and the National Association for Comics Art Educators. He created Adventures in Cartooning with collaborators Alexis Frederic-Frost and Andrew Arnold. Sturm, his wife, and two daughters live in White River Junction, Vermont.